STATE-OF-THE-ART BLADE SET TECHNOLOGY: Chrome-plated diamond-ground stainless steel blade set “Made in Germany” with integrated cutting length adjustment from 0.7 – 3 mm. Fine tooth blade set especially recommended for detail work on the head. 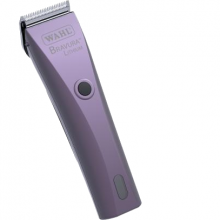 PROFESSIONAL BLADE SET: Easy removal to facilitate cleaning and easy changing of the blade set. Further blade set options are available. LITHIUM POWER: Clipper equiped with durable and highly efficient lithium ion battery without memory effect. The newest lithium generation from the automotive industry with five times longer lifetime than common NiMH batteries. POWERFUL: The clipper with the power battery for detailed trimming comfort of all coat types. Battery provides up to 90 minutes of power. Quick charge within 60 minutes.